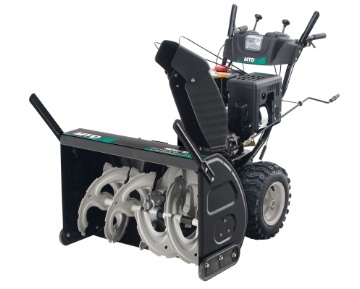 The Yard Machine Snow Thrower H95KI comes with a 357 cc engine. It can clear 33 inches wide of snow at a time. 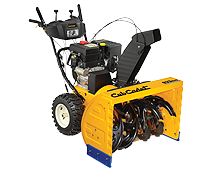 With the 22 inch intake height, you should not have any problems clearing snow from your driveway and walkways. It has the standard 6 forward and 2 reverse gears to allow you to match the speed that is comfortable with the amount of snow you need to clear and your own walking speed as well. A nice feature is the steerable wheel drive that allows you to change directions left or right simply by clicking a trigger. It is easy to adjust your direction if you get off track a bit with just a click of the trigger. It also comes with an electric starter and a manual backup as well. No need to struggle trying to pull the cord fast enough to start this engine. Note that it also comes with drift cutters to help make a nice clean edge to higher drifts that you may encounter from time to time. Electric Start: No need to pull. Manual back-up. Arctic tested high-impact 6” polymer chute: won’t rust, dent or crack! This is a great machine for the average homeowner. It comes with in dash lights for night time work, folding handles for easy storage and ready to go engine with oil already in the engine. Always check the oil level before starting it for the first time. Just unfold the handles, add fuel and you are ready to go! 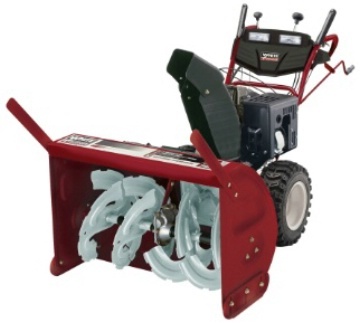 This Yard Machine Snow Thrower H95KI is a powerful machine and should be treated with safety in mind. Carefully read all of the safety guidelines in the manual prior to operating the machine for the first time and follow these guidelines to ensure that both you and the machine do not have an accident. Prior to starting the Yard Machine Snow Thrower H95KI the first time each day, perform a quick walk around check of the machine to ensure there are no loose parts and no leaking fluids. Check the engine oil to ensure that it is at the correct level as specified by the manual. Top up if necessary. Fill the fuel tank while the engine is cold and prior to using the machine. If you do spill fuel, wait until it has fully evaporated prior to starting the engine. Never spill fuel on a hot engine to avoid fires and always fill the fuel tank outdoors to avoid any possibility of vapors going into your house.